-- The weather resistant backpack has heavy duty zippers and utility-style cord pulls,side and front load compression system. -- Adjustable straps on the bottom of the military backpack are for the sleeping bag or tent,the backpack is suitable for camping or other outdoor activities. -- Shoulder straps,chest strap,waist strap of the military backpack are adjustable and removable.The straps length can be adjusted as you need.You can also remove the chest strap and waist strap if you do not want them. 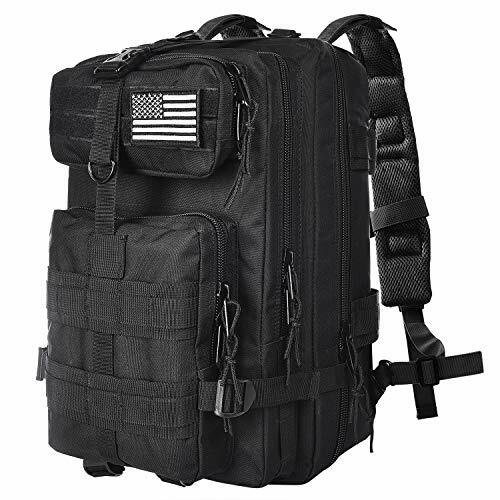 -- Cool design,the outdoor tactical backpack comes with a American flag patch on the front pocket. -- The inside pouches of the backpack are made by waterproof material,wearable and durable. Tactical day pack is made of high density 600D fabric, water-resistant coating inside. Tactical MOLLE backpack with REMOVABLE tactical bag patches on the front pocket, you can replace it with other military patches velcro. 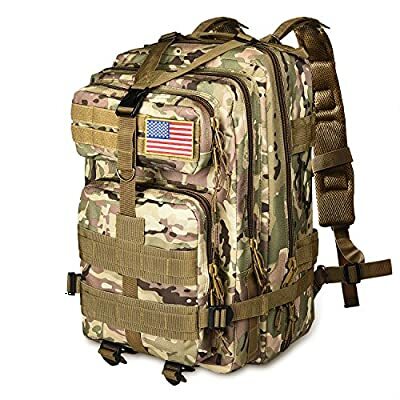 Tactical packs and bags has side and front load MOLLE compression system, padding breathable back area, ventilated mesh padding and adjustable shoulder strap. Military tactical backpack can be used as 3 days assault back pack,combat backpack, military army backpack for men, survival backpack, ammo backpack or military sport bag. Outdoor backpack for men and women has hydration compatible for hydration bladder(backpack didn't include hydration bladder)as hydration back pack, camping hiking backpack, and daily school backpack.